In need of a vacation? Imagine relaxation and adventure in your own backyard! I had the opportunity to stay at the beautiful Hotel Alessandra in the heart of downtown Houston. The marble floors, grand staircase, gold accents in every room, and modern chic décor are breathtaking. And, upon request, one can have a room with floor length windows, a soaking tub, and/or a walk-in shower! It was just the place that I envisioned for the ultimate staycation! If you're planning on visiting Houston or looking to get away without traveling too far, downtown is a great area to stay in. It is in the center of the city and close to many attractions. The hotel also offers a free shuttle service in their very own fancy Maserati to any place downtown! Here is my list of things to do downtown! Music is a great way to let loose and release mood-enhancing endorphins in the brain! Just think pure happiness. Some restaurants, like Sambuca and Batanga, have live music several nights a week! Conservatory - Houston's first food hall is located underground. One can choose from tacos with tamarind-based BBQ sauce at El Burro, poke bowls, or build-your-own pho bowls at The Pho Spot. My fave: the premium phở đặc biệt has ribs, oxtail, and bone marrow. YUM! At $15, it packs so much rich flavor! Xochi - The newest food concept from Chef Hugo, James Beard's Best Chef in the Southwest Award winner! If you're looking for an experience and don't mind spending a little money for it, visit Xochi and try one of their many moles from their cuisine inspired by Mexico's state of Oaxaca. 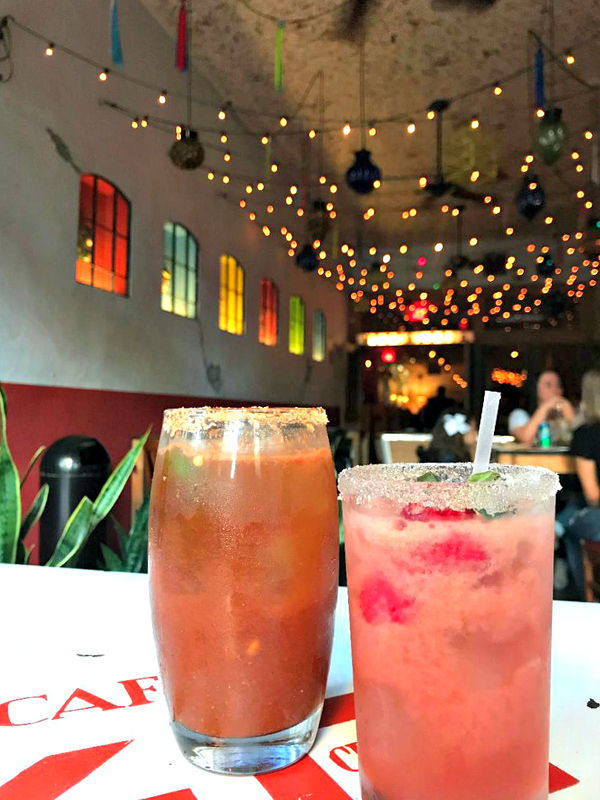 Local Foods - They have locations all over Houston, and this one is like the rest with its outdoor patio and eclectic décor with food sourced locally. This location is the first to have an upstairs dining area, underground event space, and a bar. Enjoy a limeade, garden sammie, and pozole outside! La Calle - Come here for Mexico City style street tacos and beer. They just opened a bar next door, too! Peli Deli - The latest from the Peli Peli restaurant group is only open for lunch on the weekdays. They offer delicious South African fare, and their oxtail dish and naan tacos are a must! 1. Discovery Green is a park located a few blocks away with kayaking, live music, free workout classes, events, lots of green to play on, a fanciful fountain, and really cool art installations. 2. Market Square Park hosts bingo and movie nights, fitness classes, and more fun activities. 3. Buffalo Bayou Park has plenty of trails to run and space to play sports, Jamail Skatepark for skateboarding, tours of their cistern, and boat rentals with an amazing view of downtown. 4. Sphere (think HIIT + soccer) classes were created by our very own Dynamo star, Michael Chabala. Take a class, if you are up for the challenge! Broadway shows, Houston Symphony, and more! 1. Dean's Downtown was built in the late 1800's and used to be a department store. Now, it's a cozy lounge. Grab a drink and seat inside the third oldest electric elevator in the country. 2. The Pastry War has quite the selection of tequilas and mezcals. Try them with their tamales! 3. Frank's Backyard will have you feeling like you're chillin' in your own backyard! Check our their extensive bar and craft beer selection and sprawl out in a lawn chair. If you forget to pack a hat or need a last minute accessory, stop by the two-story Forever 21 next door. GreenStreet also has the make(her) boutique, where three local businesswomen sell their handmade goods. The Tipping Point is the first and only creative lifestyle boutique in downtown Houston! You will find limited edition sneakers, men's streetwear, and cool books & art here. Scope out the game schedule and catch our World Champions, Houston Astros, or leading Houston Rockets in action! Now, for the To The Nines Ultimate Staycation GIVEAWAY!! Win a one night stay at Hotel Alessandra, a workout with me, and a drink at their bar. 1. Follow @TeresaThuy and @HotelAlessandra on Instagram. 2. On my Instagram page, find the photo that I posted on 4/25/18, and tag someone that you'd like to enjoy the staycation with or that you think deserves a vacation in a comment. Each comment counts as an entry! I hope this helps you plan a fun day exploring downtown, a vacation, or the Ultimate Staycation in Houston!